Fond of Snape » Blog Archive » Haven’t done one of these in awhile! Haven’t done one of these in awhile! 1. It’s time for all of us to be more positive. 2. My new home; it’s not a bad place for friends to visit, the kitchen is fantastic to cook in, and I have a spare room…come visit. 4. My time in Japan is the best thing I have ever known. 5. My life is simply upside down lately. 6. The last time I laughed really loudly was when I saw a big ole dog laying on top of a picnic table…he took up the whole top and it looked so funny. 7. And as for the weekend, tonight I’m looking forward to being unhooked from my chemo bag, tomorrow my plans include something spontaneous and Sunday, I want to possibly go to Ikea! I’ve been getting a pretty positive vibe from you–I hope your weekend rocks. You get better, lady! There’s no blogosphere w/out Janet! Positivity is definitely a good. The part of me that isn’t a huge xenophobe desperately wants to go to Japan. Hope you have a great weekend. And are feeling stronger and better every day! What does the thistle represent? 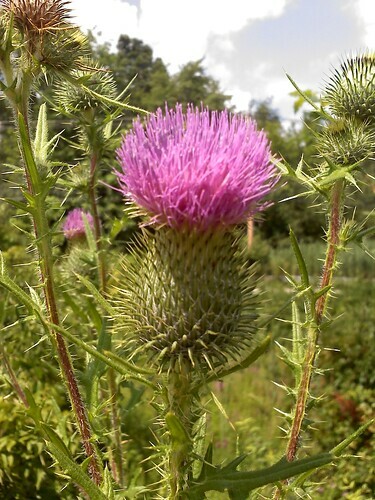 that thistle is really pretty … and I think you’re pretty amazing. I have a thistle tattoo! I love it. You aren’t crazy or alone. Here’s to a happy weekend for you free of the chemo bag! Re: #3 – you are NOT crazy you are just optimistic and that is GREAT. I’m here for you my dear….and the price will be gallons of “mad” strawberry ice cream – that was delicious! Great questions! Even better answers! Hang in there, Janet. You will be well. Continuing to think of you…! #1- Yep, I must agree. I’ve been working on doing just that! #2- Your new place sounds fantastic. Just what you needed. I hope to come see you one day just as I hope you come see me. Maybe I’ll even have a new place by then. #5 It really has been upside down lately. You handle it with such grace and strength that I often think of you when I need to find my own grace and strength. I admire you, chicky. Thank you for the inspiration, even if you don’t know that you are doing it. I’d say you inspire us all in one way or another.